This is a collection of particles filtered from the oil in a transformer. 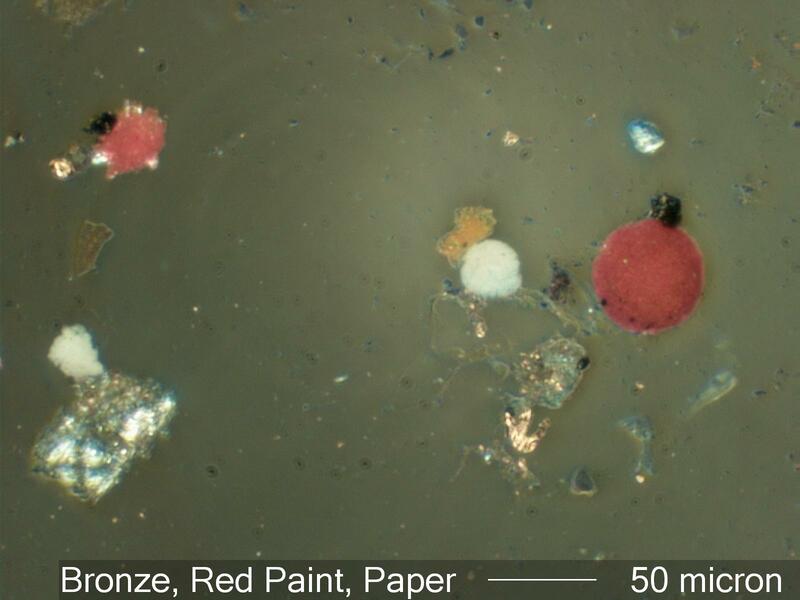 It includes red and white paint spheres, limonite flakes (orange rust), a plastic fragment with an include starch grain (particle with black cross), red sealant fragment (upper left), and bronze metal fragments (small bright particle upper left and cresent lower right of center). Particles in transformer oil include debris from construction, maintanance activities, metal corrosion products (rust, etc. ), paper aging debris, oil sludges and polymers, wear and erossion products from transformer components, heat generated debris including charred paper, arcing debris, and foreign contaminants such as insect parts, plant parts, pollens, fungal fragments, natural minerals, etc. These particles carry the history of the transformer and give clues to its current condition.